A computer generated image of a torpedo being launched from a submarine. Image courtesy of Retinal Reality. 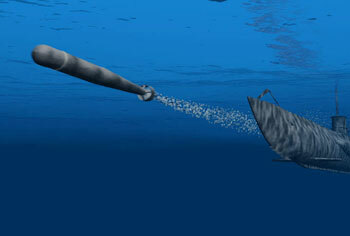 Torpedoes used by underwater submarines produce more than just an explosive sound upon detonation. After an initial firing, the sound of the outer hatch can be heard closing. The torpedo can then be heard moving through the water to the target. The length of this sound is dependant upon the distance of the target. Finally, a large explosion is heard. Torpedoes are also associated with a pinging noise used by the sonar for torpedoes before firing.